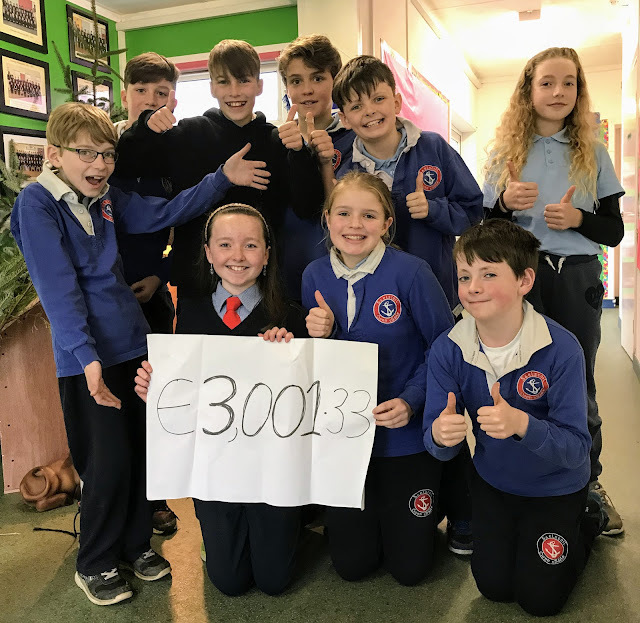 Nuacht Eile / Other News: Thank you! We are the artistic committee for the Simon Community Fundraiser 2017. We are sure you must have seen our beautiful posters up around Kinsale advertising last Friday’s coffee morning. So we would like to take this opportunity to thank everyone who helped us to raise €3,001.33 for Cork Simon Community. To those who baked, donated money, donated raffle prizes, who attended on the day, to the teachers for allowing us to do it, to Darren on our web team for taking the time to put up all our posts and a huge thank you to Carol for organizing this annual event. We contacted Cork Simon today and once again they have asked us to buy sleeping bags again this year. They are delighted with the huge amount we raised and we are delighted that we can make some difference to our homeless people this winter. So Happy Christmas to all and a final thank you for your support from the children of 5th and 6th class.